On Wednesday of this week the Migrating Forms Festival will host an inaugural run of events to supplant the now defunct New York Underground Film Festival. The new event, which is likewise being hosted at Anthology Film Archives in New York and will run until April 19, grew out of the NYUFF (see our previous feature) after that event ended a successful 15-year run last spring. 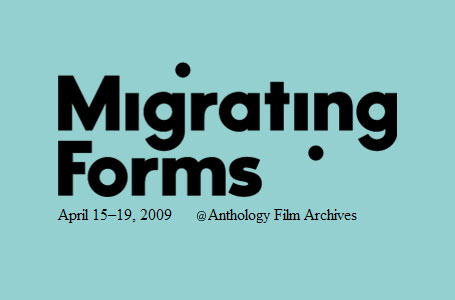 Migrating Forms is helmed by many of the NYUFF organizers and, like its predecessor, will continue to focus on new experimental film and video projects. The series' opening night, on Wednesday, April 15th, will include an 8pm World Premiere of director Owen Land's film Dialogues, and the closing ceremonies on Sunday, April 19th, will feature an 8pm World Premiere of The Earth Is Young by Michael Gitlin. In between there will be more than a dozen feature-length films on offer, along with some four dozen shorts and a series of special programs with additional discussions and film screenings. Tickets for the festival are available online via Brown Paper Tickets for $8 (until midnight the night before the screening) and at the Anthology Film Archives box office for $10.